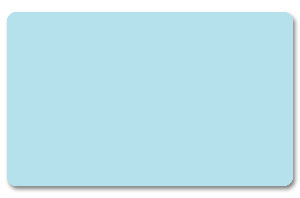 CC30 Sky Blue Cards are credit card size (CR-80) with a 30 mil thickness. CR-80 30 mil cards are the standard size and thickness of most identification cards being used today. Our PVC cards are designed and manufactured with the highest graphic quality materials for excellent printing results. These PVC cards are used in today’s direct-to-card and re-transfer card printers. The CC30 Sky Blue Cards are perfect for: ID cards, gift cards, business cards, membership cards and loyalty cards. The PVC cards are packaged in quantities of 100, quality inspected and shrink wrapped for protection and convenience. Use monochrome printer ribbons for the best quality image.